William Yeomans served as Sen. Ted Kennedy’s chief counsel on the Senate Judiciary Committee and as a Justice Department official. He is now a law professor at American University. 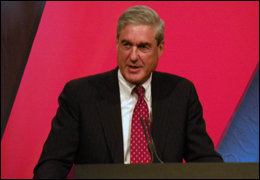 Robert Mueller has had a stunning record of success in transforming the FBI into a domestic surveillance and security agency. That success should disqualify him from service beyond the expiration of his term in September. That’s right, you did not misread this. Extending Mueller’s term beyond the 10-year limit imposed by Congress — as President Barack Obama now proposes — may serve to weaken an important, and still necessary, protection designed to prevent any director from accumulating the power that J. Edgar Hoover misused. Equally important, Mueller’s continuing as director would delay evaluation of the FBI’s profound transformation since Sept. 11, 2001. Posted: 6/8/11 at 8:50 AM under FBI, News Story.